Two epic adventures of conquest, destiny, and vengeance, God of War and God of War II, return for the first time on BluRay Disc! In God of War: Collection, you will experience the dark world of Ancient Greece through Kratos, a brutal warrior determined to murder the God of War and alter what no mortal has ever changed… fate itself. 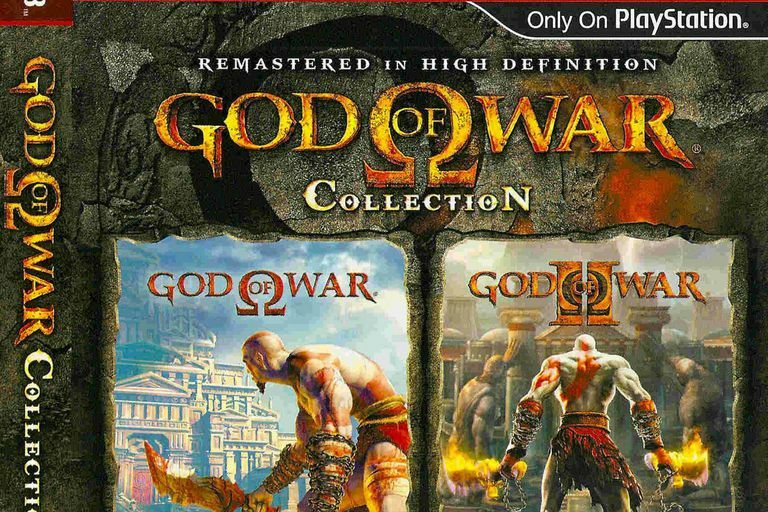 Since the God of War: Collection features both games on one disc, the cheat code pages here will all be together. This way you can see the hints, tips, cheats, and newly added trophies for both games in one spot. The following trophies can be unlocked in God of War: Collection (the original, remastered version of the game released as a PlayStation 3 Greatest Hits title). Complete the Centaur sacrifice to Hades. Rescue the Oracle with 10 seconds to spare. Free yourself from the depths of Hades. Complete the Challenge of Atlas. Die enough to get offered Easy Mode. Obtain the head of the Architect's wife. Get a 100 Hits Combo. Get a 200 Hits Combo. Complete the Challenge of the Gods. Collect all of the Muse Keys. Complete the Spike Room Box Puzzle. Collect all the Gorgon Eyes. Watch the 'Birth of the Beast' Treasure. Win the first Minotaur fight. Win the first Cerberus fight. Win the first Satyr fight. Max out all Weapons and Magic. Beat the game in under 5 hours on any Difficulty. Collect all the Phoenix Feathers. Unlock all God of War Trophies. Climbed the Spiked Column in Hades without taking damage. Open a Health Chest when your health meter is already full. The following trophies can be unlocked in God of War: Collection (while playing God of War II on the disc). Battle your way to the Loom Chamber in under 10 minutes. Acquire Rage of the Titans. Beat the Challenge of the Titans. Kill the Colossus of Rhodes, the Dark Rider, and Theseus. Kill the Barbarian King, Euryale, and Perseus. Kill the Kraken and all three Sisters of Fate. Defeat the Dark Rider for the first time. Collect and use at least 2 Urns of Power. Topple the Temple in the Bog of the Forgotten. Win the battle outside of the Palace of the Fates. Climb from the pit of Hades. Defeat the Titan Minotaur inside Atlas. Acquire the Head of Euryale. Open the door to the Temple of Euryale. Open the wings of the Temple of the Fates. Stone and Shatter 30 Enemies. Get a 500 Hits Combo. Cross the collapsing Grapple Bridge. Unlock all God of War II Trophies. Solve the riddle of the Fire Phoenix Statue. Whip the Steeds of Time. The following items and gameplay modes can be unlocked in God of War (original) on the God of War: Collection disc. Beat the game on Spartan Mode. Beat the Challenge Of The Gods. Beat the game once on any difficulty. Beat the game on God Mode. The following items and gameplay modes can be unlocked in God of War II on the God of War: Collection disc. Complete the game on Titan mode. Complete the game, then start a New Game+/Bonus play. Complete the game on any difficulty level. Complete the game on God mode. Collect 20 Cyclops eyes. Must kill them with a context-sensitive move. Meaning the O button. Receive God ranking in Challenge mode.